Autumn Schreiner, Wabaunsee – Soph. The sophomore tore it up in 2018 for the 2-1A state champion Chargers. She hit .516 with 47 hits, 28 RBI with 40 runs scored. She was a double machine as she had 19 of them in 2018, just three off the all-time state record of 22 in a season. Schreiner also had seven triples and three home runs. She was also 8-2 in the circle this season, one of those losses coming to 3A power and state champ Silver Lake. The Wabaunsee High School Booster Club would like to congratulate the 2018 softball team on the 2-1A state title and all of the players and coaches! Congrats on your postseason honors from Sports in Kansas! 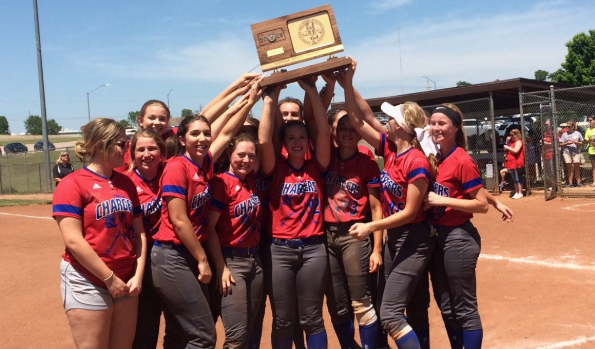 Jocks Nitch of Topeka would like to congratulate the 2018 2-1A State Champion Wabaunsee High School Softball Team. Jocks Nitch of Topeka is a proud supporter of Wabaunsee High School Softball. Congrats on all of your success! Jurging threw two no hitters this season as a senior and hit .547 with seven doubles, four triples, six homers and 29 RBI this season. She had 129 strikeouts in 75 innings pitched this season on the way to a third-place finish at the 2018 state tournament with a 20-6 overall record. Her pitching record was 10-4 and also picked up a save. Bluestem High School would like to congratulate Ashtyn on the 2-1A Pitcher of the Year from Sports in Kansas and also congratulate the 2018 Bluestem High School Softball Team on an outstanding season. Congrats to all player who earned postseason softball and baseball honors with Sports in Kansas! Oliver, more known as one of the top basketball players in 2A Kansas, caught fire in the softball postseason for the Chargers. She had 10 RBIs at the 2018 state tournament, five each that came in the state championship and state semifinal. She had eight hits over three games in the tournament to lead her team to the state championship. She also had a very solid overall season, earning first team 2-1A honors after hitting .452 w/ 38 RBI. Oliver had 23 or her 38 RBI and 22 of her 38 hits in the month of May. Henry led the Chargers to the 2018 2-1A state title in dominating fashion at the state tournament. The Chargers (20-6) outscored their three opponents, 37-6, over the course of three state tournament games. They knocked off Republic County, 11-3, in the quarterfinal, before also beating Bluestem, 11-3, in the semifinal, then went on to capture the 2-1A crown, 15-0, over defending state champion Chase County in the title game. Wabaunsee record may have been a bit deceiving entering as they play in one of the best 3A leagues in Kansas, Mid-East League, that features teams like Silver Lake, St. Mary’s and Rossville. The Chargers hit .372 as a team with 20 home runs in 2018. Wabaunsee had 61 doubles, 20 triples and 20 home runs this season. Util- Jaycee Blazek, Republic Co.
OF- Brittany MacLean, Republic Co.